I have a real fondness for Horror Short films. If you've read any of my past blog posts such as "The Rise Of The Horror Short Film" (you can read it HERE) then this is no surprise. Short films have the power to ell us a story in a restricted time and leave us wanting more from it and sometimes that curiosity is satisfied when those short are turned into feature length films. Here is a list of films that started out as Short films and were later turned into feature length movies, I'll also post the original short that started it all. The cult hit of 2018 actually started out as a short in 2011 under the same name. 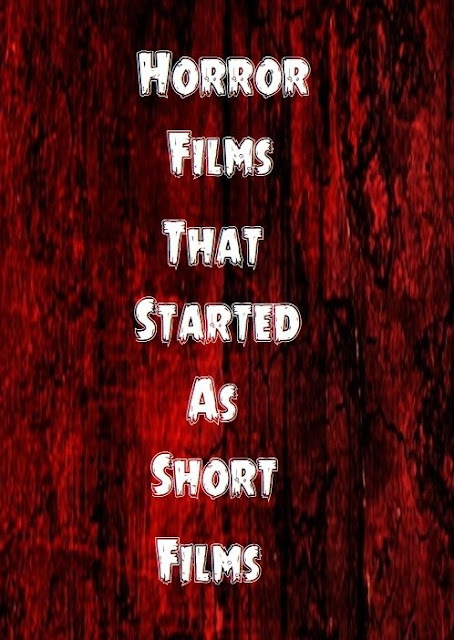 Whilst trying to get funding for "Evil Dead" the Short "Within The Woods" was created. It was back in 2005 that director Jennifer Kent created her vision with the short titled "Monster". This Japanese hit first came to light as a short in 1998 as a short called "In A Corner"
Under the title "Tooth Fairy" this short had studios fighting over each other for a full length feature. The feature film was first a short that was released in 2006. Another 2006 short that managed to became a full length feature. "The Sitter", a famous short that's so good it was used as the opening segment of the eventual feature film. This Horror fan favourite first came round in 1996, 21 years later we finally got that feature film. In 2001 a future Horror franchise was brought to life, in 2004 it was finally turned into the worldwide surprise hit. The short of the same name became so popular it grabbed the attention of film maker Guillermo del Toro who helped get the feature made. Writer/director Nicholas McCarthy made the short and got it premiered at Sundance, just one year later the feature length film premiered at Sundance. Have you seen a Horror short you'd like to see turned into a feature length film? Let me know in the comments below.